I Made a Handy Cloth Pouch! What do you think about the latest design? Drop a comment below! Humble Brag: I Won First Prize in the Instructables 2017 Leather Contest! It was hours in the making, but I found that my time spent on this side-project was really less about mine, and more about theirs; The Instructables community, that I'd be diving head first into. Every day there are dozens of newly added, beautifully illustrated and orated tutorials submitted on Instructables.com that blow me away. Despite my habitual DIY, step-by-step posts via Imgur and Reddit, for some reason I had never thought to get involved in the Autodesk-affiliated company. But thanks to a friendly tip about their upcoming leather contest, I figured, why not? Let's see what I've got compared to the pros of the tutorial world, and maybe inspire the less-experienced to have a go at the hobby. About a week after my Custom Laptop Sleeve submission, these were the results! Anyway, that's all for now. Just thought I'd share. Have a Merry Christmas, everyone! I doubt many read these, but I should really just get better about posting here more often, if not for my own benefit. But it's sure been a hot minute. That said, it's high time I share some rather exciting goings-on that have taken place around here in recent days! There was a bit of a rough patch in setting up the 50W behemoth and working my vector files over for compatibility, but he's playing very nicely with the rest of the shop now. Larry 2.0 is manageable as he is efficient with his work, which makes everyone happy! (I had more to say, but all my text got deleted somehow and I just can't be bothered to rewrite it all amidst my fuming anger :) ) But RIP Larry 1.0, may your rays shine bright and cut swiftly in Lazor heaven <3. Now, for the uninitiated, Reddit + Imgur are my go-to hosts for all the build logs that I've made. And just like any other post, I don't expect too much upon initial release of the one I was putting together exactly one week ago today; Perhaps a few witty jokes, overly critical comments, and general acknowledgement that I'd done a neat thing. But I couldn't have been more wrong. Project: Bob Tote went viral. Within 48 hours, the Imgur album gained 600,000 unique visits, earned ~1,000 comments (mostly birthday wishes), and received 30,000+ Reddit upvotes! That's enough to place my project near the current TOP TEN OF ALL TIME r/DIY posts, a community of fellow makers going about 13,000,000 members strong. A firm pat on my own back was swiftly administered following that discovery. And I'm just now summiting the pile of work that came my way as a result! But what's more important is the fact that it quickly became a monument to Bob's greatness as a business owner and human being on his 78th birthday. This one's for you, Bob. Upgraded My Bosses Lunchbag For His Birthday! I made a Leather NFC Luggage Tag! This time last year, I was just wrapping up production on my most ambitious project ever: The Parasatchel. It took me 6 months of daily progress to achieve, and have used it every day since. So, here's the first annual update of my fully convertible satchel after 12 months of hard travel and abuse! Stay tuned for a condensed v2.0 that might come out soon ;) But check out the album below for full coverage on the current state of the original. When I first approached the purchasing staff at Massdrop about 6 weeks ago, I really didn't think much was going to come of it. As I understood, they seem to handpick what they want to incorporate into their various communities. Fast forward a month and 30 emails later: It's happening. I'd mailed off a model of my Ruler Strap to their HQ in San Francisco for studio photography. Another week goes by, I approve their listing, and the date is set for launch: April 26, 2017. Launch Day is upon us, and in the just the first few hours the event hits the stretch goal of $34.99 a piece! I was jazzed. And if the action had stopped there, I would have been thrilled. Fast forward approximately 6 days & 12 hours: I'm not even sure how I feel. It was a stew of anxiety, excitement, and complete shock. Normally it would take me an evening to produce a handful of these- how could I possibly handle such a colossal task? 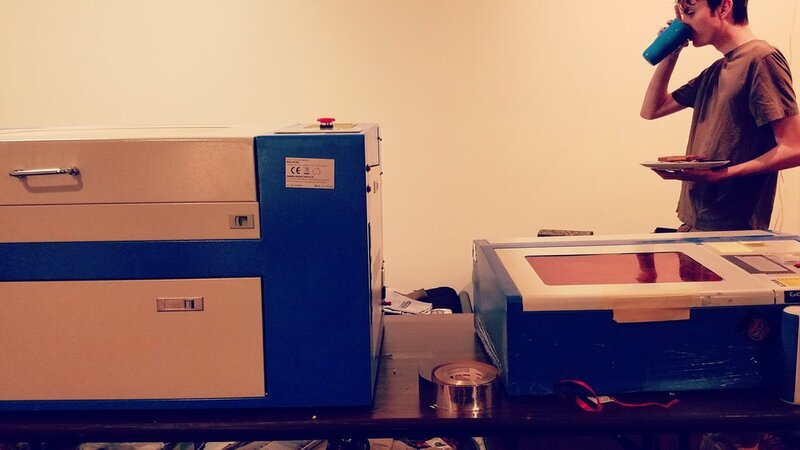 Will Larry (my laser cutter) fail somewhere in the middle of production? Will I disappoint all of the gracious backers by missing a deadline? Will my quality remain high enough to make a good impression? It was pure logistical madness in my mind. The final count was an extremely ambitious number. Never before had I felt so honored, yet so petrified by the amount of work that lie ahead. But I was grateful, and highly motivated- this has been my biggest break in exposure BY FAR after all, and couldn't afford to blow it. Luckily I'd informed the good folks at Massdrop that a personal production limit of 150 should be set (self-imposed two week cap). And had gathered enough supplies prior to make it all happen right away. These three right here deserve all the credit, frankly. Their encouragement and ceaseless desire to help with the rather monotonous production made every bit of difference. Thanks guys. We all pulled 10s of hours for days straight to knock these out. But we DID IT, and in record time; The first hundred straps were done in the span of one weekend! The rest came together in just one more day, when I was expecting to spend TWO WEEKS on this project. On a more technical level, my basic laser cutter/engraver machine takes about an hour to engrave 7 straps at a time, followed by another hour to cut them out. So while Larry was doing his job, we were processing the straps, steps of which include: de-carbonizing, un-masking, cleaning, trimming, oiling, waxing, assembling, packaging, and finally sorting them into their likeness (there were 21 unique SKUs involved), all while watching a marathon of MST3K and whatever else sounded good at the time. It was actually a pretty good time. "Orbit" EDC Travel Tray in its natural habitat. I Made A Leather & Steel Valet Tray! Stud Strap "Redux" in action. I Made A Reduced Version Leather Stud Watch Strap! Been on a bit of a streak with the smaller items these days, but they're no less derived from a personal point of utility and a ceaseless desire to make life just a little bit better. As you could imagine, I do a lot of drafting / design work, and was tired of being caught without a ruler at critical times (pun intended). So I made this! A laser-cut, NATO-style watch strap with inch and centimeter marks that run 9-5/8" and 25cm in respective length. Closure style is just one solid brass stud, no buckle necessary. And on account of my outrageously bad memory, I am a frequent user of notepads, and often find them disintegrating in my pockets after no time at all. 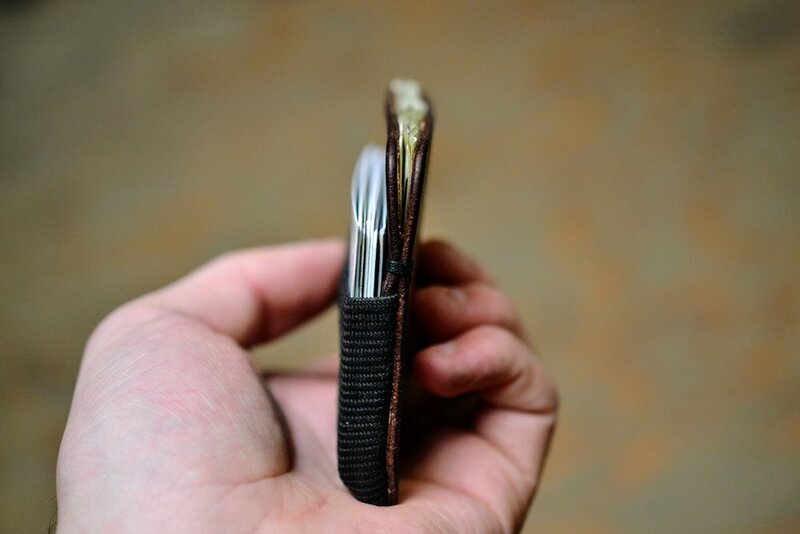 So, I took up another quick project and retrofitted my well-used Rite in the Rain notepad with two slabs of beautiful 4 oz veg tan leather to give the well-deserving tool a major upgrade in both appearance and function. Here are the photojournals of the process. Enjoy! I made a nifty ruler watch strap! I made a simple leather notepad! One of my all-time favorite designs is now being brought back to the shop here at NMD Headquarters- and better than ever. 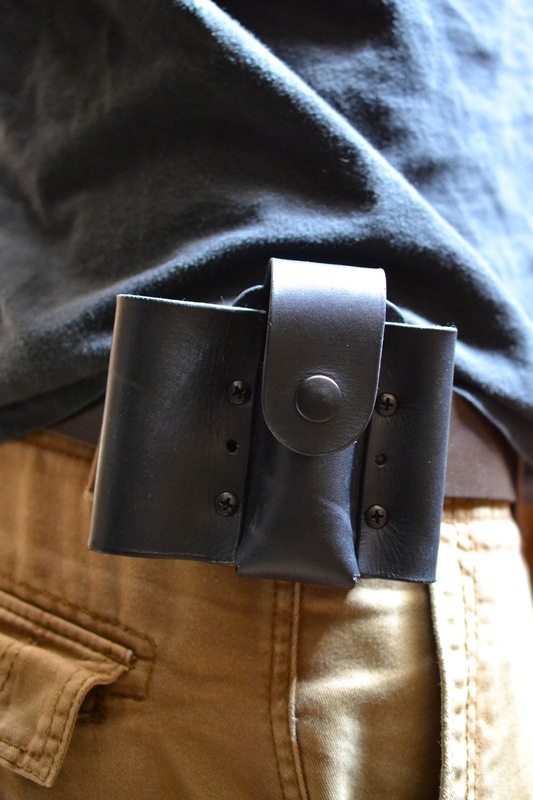 Having originally derived from a prototype design I worked on for my brother over a year ago, the v2 was the natural evolution in the Belt Rig EDC (Every Day Carry) line. The concept was simple, carry all of your daily tools in one solid place. And this was my answer (doesn't hurt that it looks rad too). Completely handmade from solid pieces of 2mm thick Veg Tan leather, powder coated steel chicago screws, brass snaps, Kydex reinforcement (now updgraded to Delrin), and a Boker Tek-Lok as the belt attachment system, this thing means business. In light of garnering new technology not originally available during its conception that has made the process much more efficient, it is a design that is now able to accommodate the precision of a CNC laser cutter, for a process that I call "laser-guided leather-craft". Instead of taking the lazier, dirtier, smellier method of fully cutting out pieces of leather after 30 minutes of continuous blasting from 40W of concentrated energy, I simply use the 2-axis laser to precision etch out the pattern to the topmost surface of the hide to then hand cut with my various blades. This also allows for any personal engraving to take place during the process. But in the end, what you get are unquestionably perfect shapes of leather with all the beauty and control of a hand-cut, raw edge. Alternatively, an acrylic pattern can be lasered out to trace and cut around as well (just less fun, because who doesn't like playing with lasers?). The Delrin reinforcement plate is now produced using the surgical accuracy of a laser too, for tighter tolerances and the sake of my lungs in not having to shave Kydex down to shape. 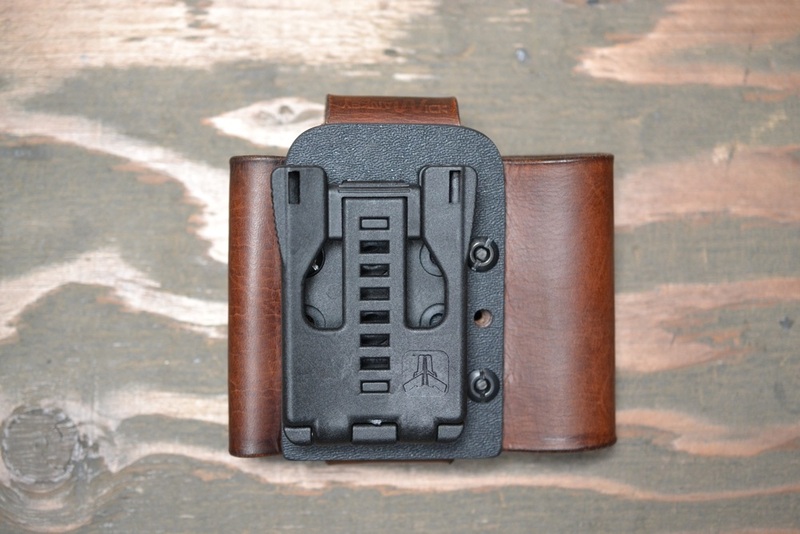 The Belt Rig v2 will be fully custom made to order based on each user's EDC gear, although the standard dimensions play very well with most of the common Leatherman models, Torches, and Pens. 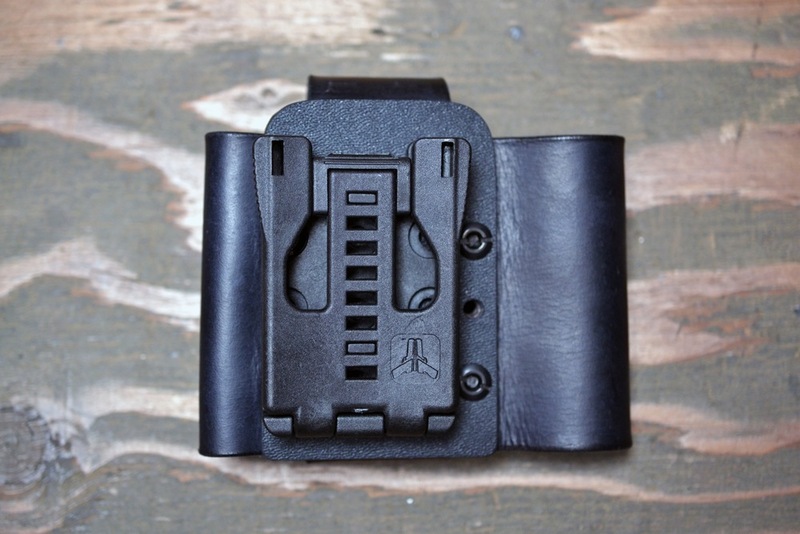 The design has also been modified slightly (longer front pull tab for the Leatherman slot, and the extra holes removed), and it will continue to improve as I see fit. But just know that you'll always receive the latest edition possible upon ordering. What's better? 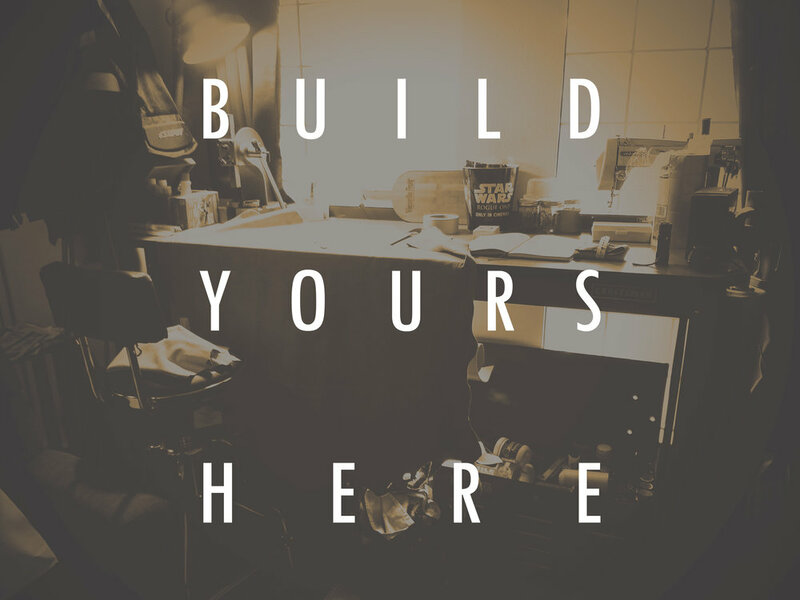 You can build yours here, right now! I had recently come across a few listing during one of my many Amazon binges that were in their "Handmade" department. This was an area I was none too familiar with, but one I figured I should at least try to be apart of. So, as a bout of pure curiosity, I submitted my rather lengthy application for admission into their seemingly exclusive program. A place for artisans to share the same space as retailers; I figured, why not? Lo and behold, I was accepted not but a few days later! A few of my most popular shop items are now being found by (hopefully) millions of people, and I couldn't be more excited about the opportunity. For those interested, you can find my Amazon Shop here. Open for Shop! + New Items! I'll be posting each of these things in my showcase soon, and full photo tutorials on how to make each of them as well, for those interested. So stay tuned for those! I will also be posting a few items to my brand spanking new Web Shop, including my latest and greatest creation, the Wine Ruck; The handy wine accessory you never knew you wanted. But I've spent a lot of time making sure everything is just right in your NMDesigns shopping experience, and can't wait to start fulfilling both mine and your wildest dreams. So, hang around, poke about, and check back soon for more design developments! Spurred along by my desire to craft things for friends and family as Christmas gifts, my latest bout of design is motivated by a sense of universality. In other words, make something that can appeal to more than just one person, yet still remain personable.